Mike Labelle, professional FIFA player for the New York Red Bulls, has reached an agreement with us. He has won seven national titles in a career that spans the past ten years. He is also an influential content creator, boasting over 280,000 subscribers on YouTube and over 70,000 followers on Twitch. He will explain everything you need to know to improve your FIFA skills. Today, he brings to you his crossing tutorial for FIFA 19. The key to crossing successfully is being aware of your other players and making sure you have players in the box who are making runs, or else you’re simply giving the ball away to the opposition. With the regular cross (simply pressing X), the cross itself will naturally curve towards a player, meaning that your body position and angle isn’t too important (but you can’t disregard it entirely). Regarding power, it depends on where you want your cross to go. 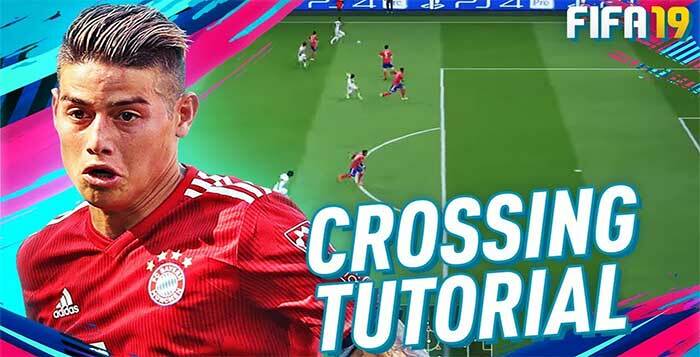 1 bar of power will usually send your cross to the near post, and 2-3 bars of power will usually send your cross to the middle of the box or the far post. You can either simply run down the wing and whip in the cross, or you can cut back inside and then float the ball to the far post. In either situation, the key part to pulling off a successful cross is understanding the trajectory of the ball and how and where it will intersect with the trajectory of the receiving player’s run. You can also cross it directly to a player instead of playing it into space for a player to run onto and connect with. This is a smart move when there aren’t any players running into space or you can’t see what’s happening ahead of the play. Another alternative is actually using the chipped through ball as a form of crossing when your players in the box are already well covered. If there is another player running towards the 18-yard box, then lightly pressing the lobbed through ball (around 1 bar of power) and directing it to the edge of the box will send it into the player’s path and open up an opportunity to score. You can also use the chipped through ball to square a pass to a player running alongside you if the goalkeeper decides to charge and close down your angles. The key is to analyze where your other players are on the field and decide which cross is the most effective at creating opportunities and maximizing your chances of scoring.